Man, I really wanted to like this one. Though I had not played any of the Assassin’s Creed games that this movie is based on, I was far more interested in the talent that they had gotten to try and bring it to the big screen. Not only do you have Michael Fassbender on board as both star and producer, but you also have the likes of director Justin Kurzel, cinematographer Adan Arkapaw, composer Jed Kurzel and many others, all of whom has previously worked with Fassbender on the most recent big-screen version of Macbeth, which was such a raw, innovative and absolutely astounding portrayal of Shakespeare’s play that added new and exciting things to the centuries-old story, mostly through its visual style. For that reason, and for that reason only, was I heading into Assassin’s Creed with more of an open mind than usual when it comes to video game adaptations, which have gained notoriety over the years for being, well, pretty bad (see: Mortal Kombat, Need for Speed, Warcraft: The Beginning, Super Mario Bros., roughly half of Uwe Boll’s filmography etc). But sadly, as I was hoping to not be the case, it turned out to be a bit of a mess. A pretty mess, but a mess nonetheless. In this film, we learn about an ancient order of assassins, who throughout history have fought against the Knights Templar over the protection of a mysterious device known as the Apple of Eden, which is said to contain the very first sin committed by Man and can be used to bend humanity to its holder’s will (hmm, maybe God shouldn’t have put that safeguard in place when he first created mankind). This ties in to our more modern story of a criminal named Callum Lynch (Fassbender), who is rescued from his own execution by an organisation that taps into his genetic code and allows him to experience the memories of his ancestor, an assassin named Aguilar de Nerha (also Fassbender) who operated in 15th century Spain during the Spanish Inquisition. The film sees Callum learns more about his ancestral past, and about the organisation that might just be using him for their own nefarious purposes. Having never played the games, I have no idea if the plot is as complicated and bafflingly nonsensical as the one in this film (though if I had a hunch, I’m guessing it does; feel free to prove me wrong), but one thing is certain: it is exactly the kind of plot I would expect to see in a video game, and not necessarily a movie. There’s a lot here that is just too farfetched for its own good, and as the film gets sillier and sillier with every new plot turn that makes little to no sense, you start to really lose your grasp on what gained your attention in the first place. The whole movie feels like a compilation of cut-scenes that are in-between the gameplay, with a lot of the scenes consisting of people talking very flatly to one another and giving paragraphs of exposition about how the process actually works, what characters need to do next, and even what the main motivations are, which in a game where you are mostly expected to just pick up a controller and play is fine enough, but when it’s a movie that you are paying to watch it can become monotonous very quickly. It simply doesn’t work in a filmic context, and as you’re watching it, you just want to just skip ahead to the fun parts, only this time there is no button or even a controller for you to do that. However, when it does get to the fun parts – i.e. the sequences set in 15th century Spain – things do perk up a little bit. For one, it’s absolutely astonishing to look at; Arkapaw’s cinematography is drenched in sunset colours and sometimes ominous shadow-lit darkness, but every time it maintains a strong visual style which, although not quite as impressive as his work on Macbeth, is still much better shot than any other video game adaptation. The action is decent enough, with Kurzel managing to stage long sequences of chases or fighting with excitement and genuine ambition, even if you’ll have absolutely no idea what exactly is going on, especially in its clustered third act that somehow manages to have TWO climaxes. An interesting addition made by Kurzel in these historical scenes is to have all the characters converse entirely in Spanish, instead of having actors speaking English with an accent; it doesn’t add much, but just that small touch on something that most big-budget films like this would normally ignore is pretty cool. Though the acting is mostly stilted, with co-star Marion Cotillard mostly reduced to a bland exposition-giver that’s more akin to the character you obtain information from in a video game than an actual person, Fassbender himself is not that bad here. As producer, he also has a larger stake in this film than others, and just goes all out to deliver the kind of intimidating lead performance most people would want from a film like this, even being genuinely good in a few otherwise problematic scenes. There are definitely some awesome aspects to this film, and more often than not you can see what the intent of the filmmakers might have been, but that doesn’t save the film from being a long-winded and rather fascinating mess. 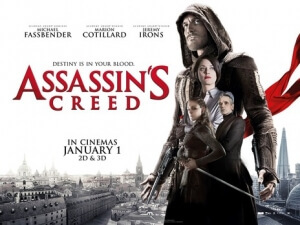 Its attempts to be the first genuinely great video game movie are noble, and in time there probably will be one that really does stand out amongst the crap – but Assassin’s Creed just isn’t it. It was close, but as ever it was no cigar. Assassin’s Creed puts more effort and ambition into being a good movie than a lot of other video game adaptations, but it still fails to work as its own separate entity with a nonsensical plot and dull scenes that make you feel like you’re watching an extended and not very interesting video game cut scene rather than actually playing it.